Art today is surrounded by explanation and contextualisation – it is 'curated'. From the outset Rudolf Gouws was the appropriate custodian of RMB's art collection. While he is first and foremost an economist, his passion for art is boldly expressed through both his fine collection at home and the pieces he has personally created. He always sought the help of art experts who could be entrusted with the purchasing, placing, cataloguing and maintenance of the bank’s art. 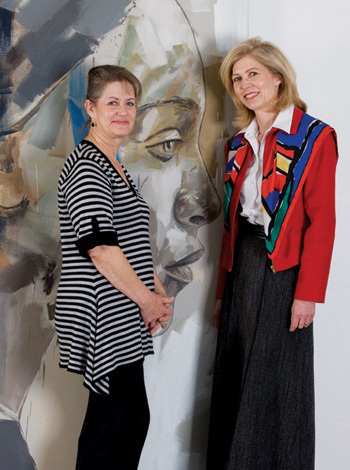 Over the years, this role has been filled by two professional art curators: Dr Leoni Schmidt, from 1989 to 1994, and Teresa Lizamore, who, after assisting Dr Schmidt, took over the curating duties on her own in 1994 and continues in this capacity to the present day. Much has changed since the first pieces were bought. RMB’s robust growth and expansion into new buildings with appealing art space, sustained an acquisition surge for many years. The focus shifted from building the Collection, to refining, maintaining, placing and protecting it, often rearranging entire floors at a time – always with the benefit of RMB staff in mind.